Helping your clients manage their risk makes good business sense. A reduction in accidents and incidents through quality EH&S training helps to lower their associated costs and optimize your profit margin. Evolved Safety is uniquely positioned to be the absolute safety training resource for your entire client base. We act as a broker for safety training resources from the top EH&S training vendors, providing your clients access to thousands of training titles and technology options, while offering unmatched industry expertise and personalized customer service. 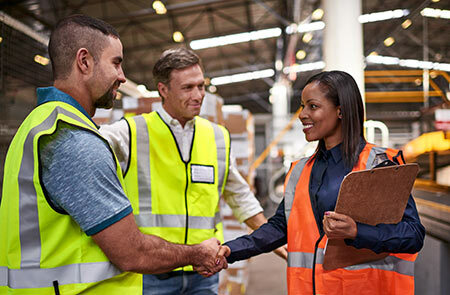 Our approach to sourcing safety training and services gives you the opportunity to easily design a program that is specific to your target client industries and exclusive to your agency. Understanding you and your clients is critical to the success of the safety program. We look at your client company markets, your goals, your marketing strategy as well as your client companies challenges and training needs to design a program that fit both you and your client’s requirements and budget, from technology needs to industry specific content. We make recommendations for training resources based on the requirements established during the needs assessment. You are free to review and explore the various resources without pressure. We’ll assist you with communicating your safety program options to your client companies with marketing support that includes a custom landing page and marketing fliers. We are happy to train your staff on how to use the program and talk about the program to your clients. We are there to answer agent questions and serve as an ongoing contact for internal and customer questions. We’ll continue to evaluation your program success and help you evolve your program as needed. Evolved Safety has over 20 years combined experience in the safety industry and working within the insurance and risk management industries. We’ve worked with several insurance organizations, including Liberty Mutual, Texas Mutual, Lockton Insurance, Amerisure, Travelers, Federated Insurance and Secura Insurance, to create exclusive safety training resource libraries that help their client companies reduce their risk. Insurance organizations choose Evolved Safety for our expertise and original approach to how we help create a safety training program – from selecting the training materials and service offering to our ongoing customer support. Save time and money without compromising training integrity with quality, accurate, challenging, and engaging online content to ensure comprehension and increased retention rates. Choose from over 2,000 comprehensive online training courses, all available in SCORM and AICC formats, that include expert content and delivery systems, as well as accountable learning management that includes ease of scheduling, tracking and reporting. Well produced and relevant video training can help to enhance your classroom training presentation or can be used to reinforce key training topics throughout the year, giving you the convenience of on-demand delivery and tracking capabilities. With over 250 DVD and streaming video titles to choose from, your next training session is sure to be a success. Evolved Safety offers your agency a convenient and flexible way to offer safety training to your client companies. Best of all, you can change your offering as your business requirements change. Selecting the right provider for your clients OSHA 10 & 30-hour training can be a time-consuming task. Depending on your client needs, price, content and delivery method are all important factors in your decision. We work with multiple OSHA 10 & 30 hour providers for both online and in-person delivery, giving you options to effortlessly find the perfect solution, all from a single point of contact. At times, off-the-shelf training modules fall short of meeting you client’s unique challenges. When a standardized course offering cannot convey the specific knowledge, your clients need to provide to their workforce, you need a partner that can deliver your client’s unique training message efficiently and effectively. We work in collaboration with your client throughout the process so they have full control over the course content. When it’s time to your client to take control of their content, we are on their team. Become an indispensable resource for your clients by offering them EH&S training resources that help them reduce accidents and incidents, stay in compliance, and lower their costs. Let’s talk about how Evolved Safety can be your complete partner for EH&S training.